NYCC 2010: Dead Space 2 Is "Done"
The producer of Dead Space 2 says the game is "done" and that the team is in full polish mode. Zach Mumbach is happy to live, breathe and eat Dead Space right now. The team at Visceral is zooming right along because, according to Mumbach, the game's producer, the process now is all about bugs and polish. With a ship date of January 25th, the Dead Space team can spend the next four months perfecting their game. For what I saw at New York Comic today, I might agree with Mumbach when he told me, "This is the best game that I've ever worked on." Some fans were upset that Isaac Clarke, the protagonist of Dead Space, now speaks in game and during cutscenes. But for a third person shooter, as opposed to something like Half Life that is told firmly through the point of a view of a voiceless character, adding a specific characterization to Isaac Clarke made sense for the type of game that Visceral wanted to make. "To push the story in the direction that we wanted to push it, [Isaac] needed to take control," Mumbach said. "It's a difference between asking 'Are you projecting yourself on a character?' or 'Are you following a character?'" For Mumbach, it was more important for the audience to experience Isaac's story rather than project onto a silent protagonist. Perhaps that's because Isaac's backstory and characterization is much more important in Dead Space 2. 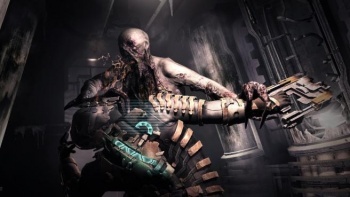 Isaac was a victim of circumstance in the first Dead Space, but, in the sequel, he is an expert. "It's kind of like Ripley in Aliens. He's got the most experience; He's the one who's seen necromorphs. He kind of bumbled around in the first one." The playable demo at New York Comic Con was exclusively on PS3s, even though the game is also being made for the Xbox 360 and for PCs. Playing with the Sony's controller takes a little getting used to at first, but there is a mastery that comes once you do. Mumbach said that even he needed to think about what the different buttons each did when he was playing on a PS3. He liked putting fans that were familiar with the control scheme in the front of the booth so that passersby could see the amazing feats that Isaac can do. It is truly amazing to see an expert use Isaac's Kinesis powers to grab necromorph's limb and then fire it back at the enemy. The demo at NYCC had us running through the short level that Activision showed during their presentation at E3. The creepiness and horror-feel is still there, and the damn necromorphs are still tough to kill. Stasis and Kinesis powers are just as important as in the first game; it's virtually impossible to kill the necromorphs without freezing them in place first with a Stasis. At Visceral, Mumbach said that there isn't a period of enforced crunch, but that long hours happen because they are passionate about the game. "No one is forced to work overtime. Most of our team is guys that were on Dead Space 1 and they really, really care. More often than not, it just ends up being two in the morning and then you're like, 'How'd that happen?'" For now, it's clear that all of the hard work is paying off.